It's quiz time. Get ready to find out the hidden secrets of your reading personality. All you have to do is answer a few questions. Ready? a. The side pocket of my carry-on bag. Books are nice, but if Ryan Reynolds is in the in-flight movie, I'm buying headphones. b. 1/4 of all available packing space. Books are important, but clean underwear has its place, too. c. As much as I can get away with. Nothing ruins a vacation faster than running out of books and I can always wash my socks out in the sink. d. I have an e-reader. I travel with more books than most small town libraries and a fresh supply is a click away. 2. Label each of the following statements True or False. I can define these acronyms: HEA, TBR, and TSTL. I know what day the Harlequin series books get shelved at my local store. When I was a kid, I always got a certificate in the public library summer reading program. I have turned down an invitation to a social event because I wanted to start and/or finish a book. When I hear the word "librarian," my first thought is "dream job." When I hear the word "librarian," my first thought is "Karina Bliss," my second thought is "rock star," and my third thought is "yum." I have read all or part of at least two of the following: the dictionary, the encyclopedia, a text book for a class I was not taking, the Cosmo Girl's Bedside Astrologer. a. None. Why would I carry books around with me? c. Two. I might finish, lose, or get bored by one. A spare is essential. 4. True or False: I have fudged the truth about how long an errand took because I was sitting in a parking lot reading. a. Wait, what? How would I know what books are coming out in advance? b. Get it when I have a chance. Sometimes I wait for the library or for a friend to lend me a copy. c. Pre-order it and pick it up (or have it shipped) the day it's available. d. Pre-order to be safe, but then stalk the author on Twitter, hoping to win an advance copy. Hmmm. You like books, but you're not letting them rule your life. You have been known to watch the occasional movie and it's unlikely you'll be caught scouring yard sales for that elusive first edition of Nora's Irish Thoroughbreds. In fact, you're not even sure you know who Nora is. You've read a book or two in your day. You can name a favorite author and if you got a book for a birthday gift it wouldn't be the worst thing ever. You might not know your local librarian's name, but you have a card and you know how to use it. Books are your life. In the future, when people are getting operations to turn themselves half-cyborg, the first alteration you'll request is an extra arm and a spare set of eyes so you can read at all times. It's highly likely you not only take quizzes on book blogs, you get the high score. Tell us your score in the comments. Post your own reading personality test question. Share a great library memory or your favorite spot to sneak a few minutes with a book during the day. Or tell us what you're reading right now because we're always looking for a new recommendation! Disclaimer: I'm a champ at reading, but not so much with math. I hope the scoring tallies are correct. My score was similar to your. I didn't add them up because it's too early to do math and I haven't had my coffee yet. The problem is I'm similar to so many of those that I had a hard time choosing. I'm a wishywashy reader, I suppose. I like to read several books at once - up to about 5 books. I often choose what I'm in the mood for given the day and what I really want to read. Currently, I'm reading a John Sanford book, a Linda Castillo, and a Lisa Kleypas along with a non-fiction about South Louisiana. So I certainly resemble those remarks. Great quiz. Mine was 10 points. It would have been more if I would have taken this quiz 5 years ago. 5 years ago I had a job with short hours and great money. I had all the time in the world to read and I would read up to a book a day sometimes. Now my job has long hours and horrible pay so I barely have time to read. Ellen, you crack me up. I'm not quite at the cyborg arm an extra eyes point, but getting there. And thank goodness I keep a book or two in the car because yesterday I was stranded at a car repair place getting my brakes fixed and if I hadn't had Kat Martin's Against the Fire to read I would have gone bonkers!!!!!!! Ellen, you are golden. You win the blogger prize in my book. I'm humbled by your creative genius. Like Angelina, my score is fluid, but I definitely used to consider "librarian" a dream job...and yet I didn't go that way in college. Not sure why. Maybe because I was afraid I'd be too busy shelving books to write them. Thanks, my friend, for the very entertaining read. Hi Ellen - Wow, my score was 16 - Do I win? ha ha My question would be -How late have stayed up to read or finish a book? My answer 2:00 AM last nigh - make that this morning!! Oh, Ellen, this is funny!!! No caffeine yet so did not take the test. I love to read; have read 73 this year....currently reading one of Joan's books...anxious to read yours. Great post, Ellen. And I love Tammy's question. Many's the time I meant to go to sleep at the prescribed hour only to be caught up in a story...and you know the rest. My score is fluid, too. I don't read much when I'm writing because it affects my voice. I read between manuscripts. I plan on hitting the books hard beginning next week, when I am practically done with the chef books. Yay! Great quiz, Ellen! I really enjoyed it! I'm a ten. Does anyone else here have a 'point of no return'? That moment when you realize you can either be sensible and go to bed, or stay up to finish the book, even though finishing it will still take at least an hour or three??? But you look at your watch and look at the book and realize it's too late. In some corner of your mind, you've already made the decision to finish the book! So NICE to see your smiling face attached to your post. Yay for Blogger letting you join us again. I almost put in a question about how many books you're reading at once. I'm often reading some fiction, a YA (with my kids or in hopes of discovering something good for them), and a non-fiction. Then there are the manuscripts I critique for friends. Always lots of books at once around here, too. Hi Angelina--looks as if a lot of us are in the Perfect 10 zone. I didn't even plan that! I look back fondly on my days of breastfeeding my kids. I was *forced* to sit around reading while they nursed. So very lovely. I don't have that kind of time anymore, either. EllenToo swears that when I'm retired I'll have lots of time for reading again. She's my beacon of hope! Hi Sarah--I was a bit concerned about what I was revealing about my own secret hopes for the future when I wrote that cyborg arm thing. ;-) Glad you enjoyed the post. Hi EllenToo--the emergency book rules! That question was inspired by the fact that I forgot my book when I went to work on Wednesday. I was so bummed. I'm glad your day was saved! Hi Deb--Helen Brenna made up a beauty quiz one time that cracked me right up. I've always wanted to do something like that. I didn't achieve the same level of hilarity that Helen did, but I'm glad I entertained you! I worked in the library as a work study job in college. I loved it. Seriously. What a wonderful atmosphere for work. Sigh. Your question is brilliant! I've stayed up all night reading for sure. It's one of my favorite things to do on a vacation. I love it. I know I am readeraholic... I'm like Tammy too, I will read late into the night just to finsih a book... oh for sure I have a point of no return.. I must admit too, that if I am really into a book, I have taken a "mental health" day off work just to read it..
Jeannie--Ugh. The morning after an all-night reading binge is never pretty, but there are times when I decide it's worth it! Funny you mention books affecting your voice. I had just about decided I should put down the one I'm reading now. It's dark and depressing (and not well-written) and I think it's sucking the fun out of my current writing efforts. Maybe just a few more pages and then I'll call it quits. Mary--the point of no return! I love it. Definitely have been there. My older son and I read the Harry Potter series at the same time. The first two books had been out for a while when we picked them up so we read them at a leisurely pace. When the third one came out, we went to the bookstore at midnight to get one. He made me promise that I wouldn't read ahead of him in our shared copy. (He was nine and it was important to him to "know things" that summer.) He had the book all day and then he'd mark the page where he stopped reading. I'd get the book at night after he went to bed. I was a very sleepy worker that week because I'd be up late every night catching up! How about: what do you use for a bookmark? - You write down the number on a post-it stuck to the cover, as you don't want to risk bending the spine & know already this book is going to be a keeper. So it has to be in perfect shape. The post-it note on the cover is a good idea. I never heard of that. I don't usually use a bookmark because I tend to walk around with my books and the bookmarks get left behind. A post-it would always be there, though. Interesting! One of my early jobs was working in a library. Loved being the first to see the new books. Definitely would hold some back from being shelved so I could check them out first. Got really fast at shelving so I would have down time in which I could read. Librarian was okay with that as long as no one needed help and all books were put away properly. Still can shelve according to Dewey Decimal system with the best of them. Ellen--I read The Gift of Fear, which is about tuning into your intuition about people and thus protecting yourself from stalkers and people of that ilk and suddenly everything my characters did seemed to take on a dark twist. I had to put the book down while I wrote. It is an excellent book, though. I highly recommend it. We are getting ready to move right now. I started the packing process with 10 book-sized boxes. Filling them made a small dent into our household collection (not just my 20-foot wall of fiction, but the kids have shelves overflowing with picture books and my husband and I have shelves in the office full of work-related stuff). I bought 20 more boxes and am hoping that will be enough (or I will be adding 2-3 books to every other box of household goods that we pack). When I was a kid, I used to think the librarian was so lucky. She could read all day. My reading habits vary. I don't read while writing. It interferes with my crazy muse. But I can't wait to satisfy my addiction when I'm not. Ellen ~ you made me smile with your comment about me being your beacon of hope. I've never been anyone's beacon of hope before. And so far this year I have read 250 books and I need to catch up on my reviews!!!!!! After I got home yesterday I put Kat's Against the Law in my car for my next occasion. I use a regular bookmark for marking my place because of the copious number of bookmarks I have both from authors and from friends giving me bookmarks when they find one with frogs on it. Yes I collect all sorts of things with frogs on it and it's a long story as to why. I WOULD NEVER TURN DOWN A PAGE OR CORNER or my dad would come back and haunt me!!!!! As far as staying up late to finish a book I think the latest I ever stayed up reading was around five or six in the morning but frequently am up until one or two. I'm mathematically challenged, especially before I've had my morning coffee, but I know I'm up there in the 'teens' on the score sheet. I thought I was the only one who had an emergency book stashed in the car and one stashed in my handbag! It's nice to know I'm not alone. 16, I think. It's late here and my math skills are not what they should be after a long day at work, unpacking a dressmakers mannequin I've been waiting to arrive only to find she's broken, and a large glass of wine. Part of that score was due to the memory card full of e-books on my cellphone- maybe not quite as many boosk on it as the town library, but definitely more than the mobile book van that goes out to the smaller towns! I don't read as much as I used to - the drawback of taking up writing is that just when I ought to be reading more, the writing uses up a big chunk of my reading time! Well, I wouldn't have classified myself as a "books are my life" person, but the score (18) came out that way. I would have thought myself in the next category up. Hmmmm. I just finished reading Summer Reunion, which was an excellent anthology of stories including one by Sarah Mayberry!, and started on Kay Stockham's His Son's Teacher. I LOVE quizzes, Ellen, and you always crack me up. Thanks for the afternoon pick me up! My score is 14. I used to stay up all night reading if my husband was away from home but I can't do that anymore. I do read in bed all the time. I also read in the bathtub,the car and anywhere else. I carried a book to read when we were down at the Stampede grounds. Read a few chapters while waiting between events. I use bookmarks that I pick up from the library. If I have a brand new book when I'm finished reading the book it still looks new. I've been reading June Supers which I won in June here. Due to the Canadian Postal strike I didn't get them until July. I still have a couple to go but the four I've read are excellent. Ellen I had already bought and read your June book so now I have two copies of it. I'm going to give the extra copy away. I loved the story. Ellen, what a fun post! Lol, on 3 d. It's nice to be among people who not only understand your obsession but give you high marks for it. I just finished Married By June. It's a wonderful read full of warmth and humor. I scored a 14. I love to read and reach the point of no return often (up till 3 or 4 in the morning to finish!). I turn the page to hold my place or sometimes put the book face down... I know sacrilige to some folks!!! I do have to tell you that when my DH travels (especially to conferences where he may pick up books) he takes his oldest underwear and socks and as he uses them he throws them away so that he has room to bring back more books! I am definitely in the "books are my life" category. Perfect example: I took FIVE books with me today while my husband had surgery. He asked me why? I had SuperRomance, Love Inspired, Mass Market, and a history book. I chose to leave the kindle at home. Again, Why? Because I didn't know what mood I would be in at any given point of the day? So I read multiple books. Thanks for a fun post to come home and unwind by reading. Hi Patricia--I think authors like giveaway stalkers. I should have awarded bonus points for that! Ellen, too funny. Then there's that feeling when you're reading a good book bug-eyed at 2 am, an awful desperation to finish it combined with an equally awful desperation to make it last. Kristi--when you buy your library, let me know. I want to rent a room! Good luck with the move. I think it's an excellent plan to put a book or two in every box because then you can read them as you unpack each box. Hi Linda--glad you liked the post! Hi Autumn--you're not alone in going with an estimate here. The math was complicated. ;-) I love that your cell phone holds more books than the mobile van. So cool. Hi JV--this is why it's important to take Internet quizzes. We can find out all kinds of things about ourselves we never knew. ;-) His Son's Teacher is an excellent book. The story stayed with me long after I finished it. Enjoy. Hi Kaelee--I was riding the bus back from RWA and a tiny baby cried for about 45 minutes straight in the seat right behind me. I was reading an excellent book and I zoned out the wailing. Books are such good company. Glad to hear you and Joan liked Married by June. I'm always happy when people I like enjoy one of my books. Snookie! I was trying to figure out how to work that exact thing into one of the quiz answers. (Throwing away the socks.) It was too wordy to fit in. Sounds as if your husband would fit right in with the rest of us. Hi Julie--I hope all is well with your husband. Hugs. I absolutely understand needing more than one book because you're not sure of the mood. Especially in a stressful situation like that. Hi Karina--you brought up a terrible dilemma. I've been reading a fantasy series for about 20 years. I had trouble finding the last two so I had a break of about 5 years between books. When I was reading the last one, I felt so torn--wanting to see the end and not wanting to lose the companionship of these books. Love the quiz, Ellen! I scored a 15, but my reading can fluctuate with my writing. I tend to read less when I'm writing, but I make up for it in between with all nighters. I've stayed up until 4 or 5am reading, but boy do I pay for it (esp with kids who won't let me nap). My quiz question: Do you loan your books out? 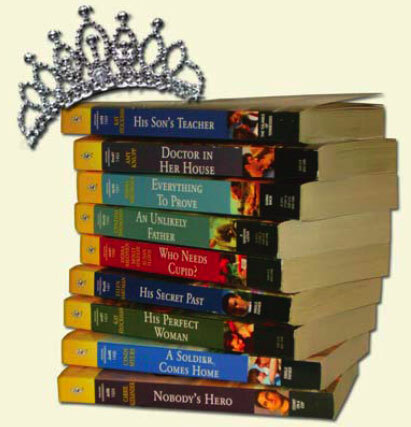 I'm possessive and sentimental about the books I read...esp. if I know the author ;). My sisters get offended when I won't lend them a book. I'd rather buy them a copy than risk never getting it back! And if it's signed, then seriously no way, no how. If you live in my house, then fine, but it can't leave my property LOL. I made 13 points up. Work & family HAVE to take precedent sometimes - I suppose. Fun quiz. I am a 12, but would be a 13 if I wasn't so old (because they didn't have a reading program way back when). Good question from Tammy. I have stayed up till 5:30 in the morning reading but hope I never do so again. I'm too old for this! I loved Snookie's response about throwing out old underwear and socks in order to make room for books to bring home on trips. Brilliant! Like Patricia, I enjoy the Dewey Decimal System. I often go into my hometown library and put their non-fiction books in order - because I know they can't get to them on the second floor when they need to be at the checkout on the first floor most of the time. Finally, like Marybelle, I thought this was a fun quiz. Thank you for sharing it! Hi Marybelle--yes, we do have to pay attention to other things once in a while, don't we. More's the pity. As I mentioned, EllenToo is my beacon of hope for a retirement full of reading! Your librarians must love you! I tend to reshelve the books at Walmart. The fiction section is always a mess and I like things orderly. I'm an 11 and after reading everyone's post, I feel this is a moderate score. What does TSTL mean.... That one stumped me? I bet I know it, but just can't place it. My score was a solid 12. I am sure I could pass over to the 15+ pretty easy though. As for a memory... the part-time local librarian stopped me in the library one day and asked why I never applied for a job there, because I was there more than she was! Hello, My name is Donya Pedigo and I am truly a BOOK ADDICT!!! Hey if you have to have an addiction.. this is the one to have! I am in the 10-14 range... that was fun!